An international team of researchers from France, the United States, and Belgium, including Attilio Rivoldini of the Royal Observatory of Belgium has measured the rotation of Mimas by studying data provided by the spacecraft Cassini orbiting Saturn. Their study suggests its cratered surface hides one of two intriguing possibilities: either the moon’s frozen core is shaped something like a football, or the satellite contains a liquid water ocean. Similar to the Moon, Mimas is in synchronous rotation around Saturn. In other words, Mimas is spinning (on average) at the same speed that it orbits Saturn. However, Mimas’ rotation rate is not quite constant. The rotation rate variations are periodic and called librations. Their amplitude depends on the internal structure (i.e. internal mass distribution, presence or not of global liquid layers) and shape of the planetary body. Among the measured librations the long-period libration is particularly sensitive to the interior structure. It is found that its amplitude is about two times larger than that one would expect for a solid planet of the shape of Mimas in hydrostatic equilibrium. Two competing hypothesises have been brought forward by the researchers to explain their result: either Mimas somehow formed with a strongly elongated core that has not yet relaxed towards a shape in hydrostatic equilibrium, or Mimas harbours a global subsurface ocean deep below its outer icy shell. 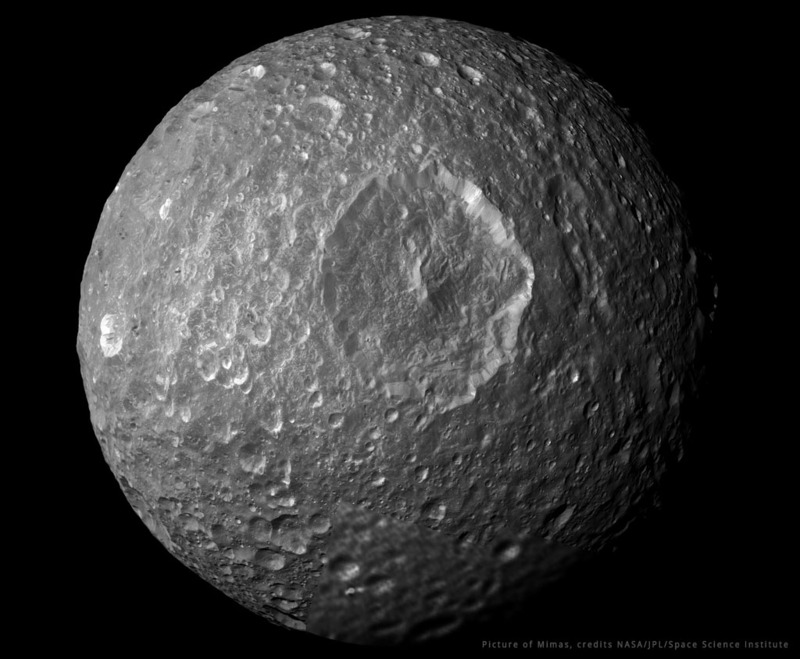 In either case, the interior structure of Mimas is significantly more complicated and interesting than one would expect from its old heavy-cratered surface. The authors are Tajeddine R., Rambaux, N., Lainey, V., Charnoz, S., Richard, A., Rivoldini, A., Noyelles, B.